And, to welcome it in, some photographs of the beautiful Nativity and Epiphany tableaux in the 17th century Church of Santa Ursula in Adeje, Tenerife. The drawing of Anthony Burgess by David Levine on the cover of Burgess’ journalism anthology “Homage to QWERTYUIOP“. So finally, after owning a copy of the novel since 1983, I got around to reading Anthony Burgess’ Earthly Powers. 650 pages is a long volume for me nowadays, although it is certainly a readable 650 pages since its structure is largely chronological, as octogenarian writer Kenneth Toomey recounts his life, friendships and travels between World War One and the 1970s. In many ways the novel is especially characteristic of Burgess both as writer and man, which perhaps explains its celebrity and its Booker Prize nomination. The narrative moves through many locations, and locations which Burgess knew well: Malaysia, North Africa, London; Italy including the Vatican, the USA including Hollywood, France including the Cannes Film Festival. The lead character name-drops many famous artists: James Joyce, Ernest Hemingway, Henry Havelock Ellis, Peter Warlock, JB Priestley, George Orwell. Literature and music are widely discussed. There are many detailed descriptions of food and drink, of fashions and furnishings. Many characters and incidents are based on real-life examples which even the less informed reader enjoys identifying. Toomey is related through marriage to Carlo Campanati, the Catholic priest who becomes Pope Gregory XVII at the exact same time as did John XXIII, although his international fame also hints at the Pope at the time of the novel’s publication, John Paul II. The fictitious Nobel laureate Austrian writer Jakob Strehler whom Toomey greatly admires has written a novel sequence Vatertag which seems rather reminiscent of Earthly Powers itself in some ways – and certainly also of The Man Without Qualities by Robert Musil and Berlin Alexanderplatz by Alfred Döblin, both rediscovered and fashionable at the time of Earthly Powers. The exploits of religious cult leader God Manning are clearly modelled on those of Jim Jones and Charles Manson. The Poet Laureate Dawson Wignall seems very similar to John Betjeman with his “themes derived from Anglican church services, the Christmas parties of his childhood, his public school pubescence…” A musical The Blooms of Dublin based on Ulysses is almost identical to a play by Burgess himself. Although, as mentioned, Earthly Powers’ chronological structure makes it easy to follow and to stay with, it does include a few modernist flourishes which show off Toomey’s and Burgess’ Joycean influences. Vocabulary which is unfamiliar and demanding, some which may well be invented, omissions of punctuation, invented onomatopoeia like “at the card table, flicking a new pack of cards skrirr skrirr with powerful gambler’s fingers”, selections of Toomey’s own writing in different genres. For me, one especially absorbing part of the narrative is the section about the Vatican as Carlo Campanati moves towards the Papacy. Campanati’s plans for the Catholic Church as revealed to Toomey could be seen as similar to John XXIII’s ideas: “the unification of the churches. The vernacularization of the liturgy” and the awareness of “capitalistic enemies, but … Marxist enemies too”. Around the time of the writing of Earthly Powers in 1978 came the drama of the deaths of both Pope Paul VI and John Paul I and the accession of John Paul II, the first non-Italian Pope in 400 years, a period which prompted regular discussion in the Catholic Church about the pontifical legacy of John XXIII. The vivid African image on the cover of my Penguin paperback edition seems out of place at first since it seems to give undue prominence to a tiny incident from a novel which takes place more often in Europe and the USA, until you notice that the figure in the wooden statue is undergoing a Christ-like crucifixion. Another favourite strand throughout the novel is the descriptions of food and drink which showcase Burgess the bon viveur as well as the descriptive writer. For example, the expensive Hotel de Paris in Monte Carlo where its restaurant serves “Saumon Fumé de Hollande, Velouté de Homard au Paprika, Tourte de Ris-de-Veau Brillat-Savarin, Selle d’Agneau de Lait Polignac…”, or “the crowded smoky (Paris) restaurant (with) potted shrimps, lobster Mornay, a carafe of house Chablis” followed by all brands of cigarettes such as “Gold Flake, Black Cat, Three Castles, Crumbs of Comfort” or Moneta in Italy with its “thick bean soup, tripe stew with gnocchi, fat sausages from the grill, the black wine that is Moneta’s pride”. Although I did enjoy the belated company in a writer of whom I used to be such a fervent fan, I did feel just a little sense of anti-climax at the novel’s ending. Perhaps because it is the sort of novel which impresses an eager younger reader rather more than a jaundiced older one, and perhaps because of another stronger sense, that this reader and the world in which he was reading were so very different from what they would have been at the time of the book’s original publication. Barcelona is a city of such global celebrity that it is striking to discover that Mallorca, a less famous part of Spain, shares some of the same visual features. 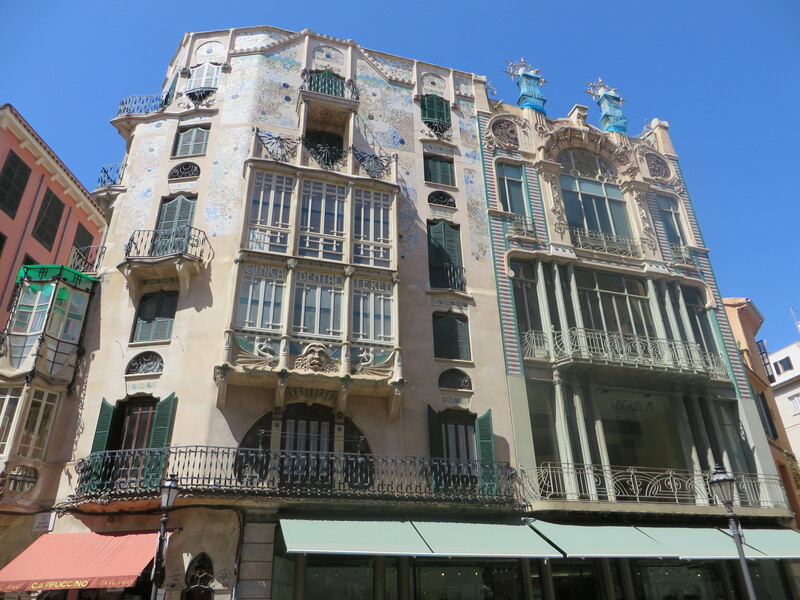 Many of the buildings on the island which date from the turn of the 20th century were designed in the modernista style similar to that practised by Antoni Gaudi. 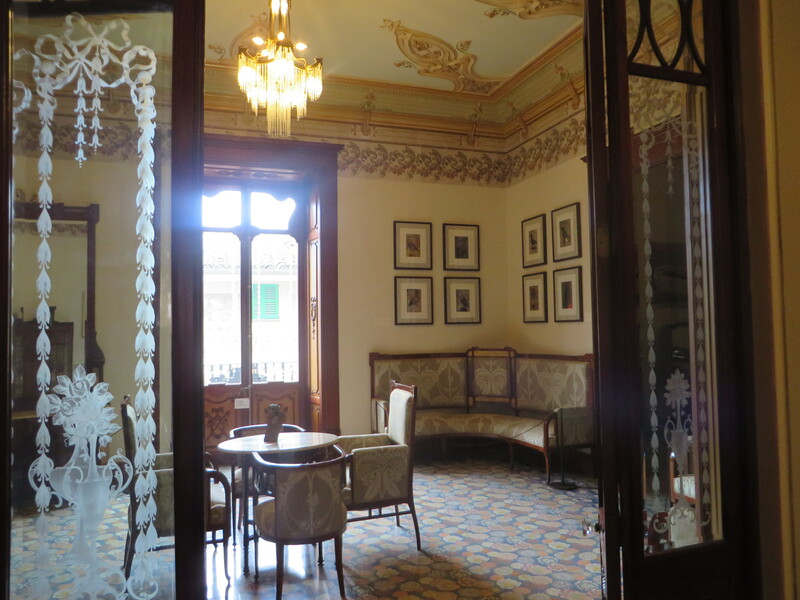 The former Gran Hotel in Palma de Mallorca, now an art gallery. 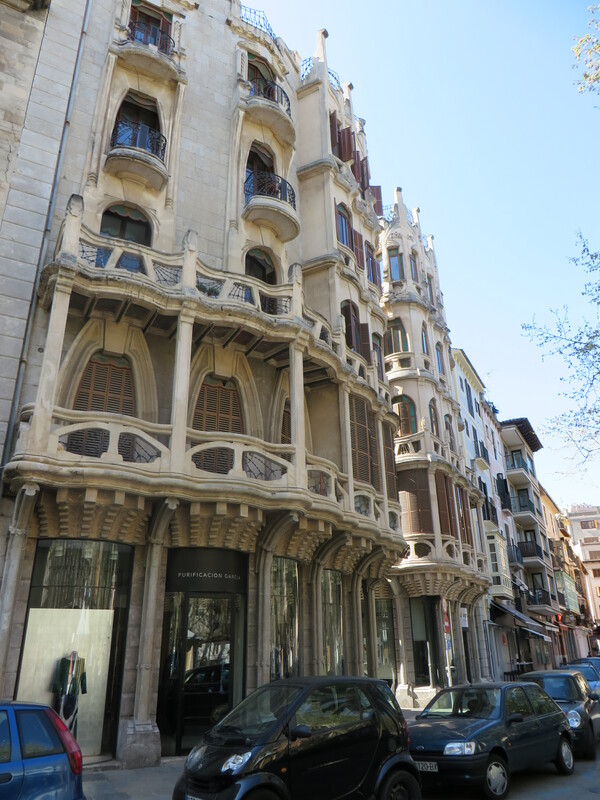 It was designed by Lluís Domènech i Montaner, a Barcelona architect who designed many buildings in that city. 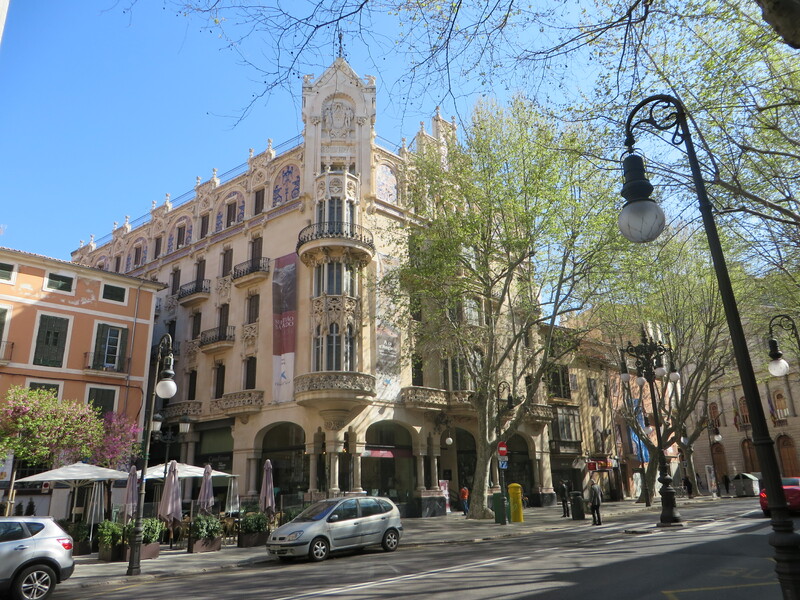 The adjoining buildings of Can Rei and L’Aguila in Palma. The latter was designed by Gaspar Bennassar. The two adjoining Modernist buildings in Placa Mercat were commissioned by the owner of a bakery business. 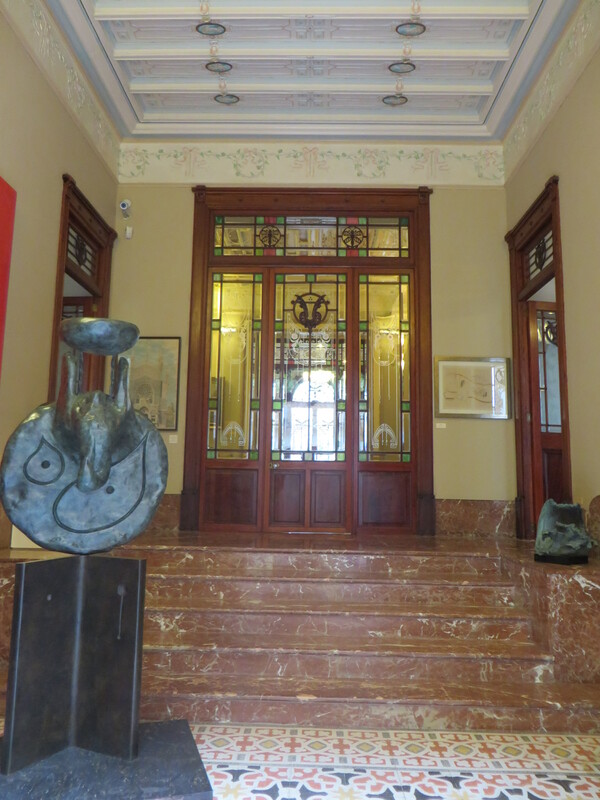 The entrance to the Ca’n Prunera building in Soller. It was designed by Josep Rubio i Bellver who worked with Gaudi on many of his famous Barcelona projects. The former residence is now open to the public as a museum of modernism and art gallery. Another interior view of Ca’n Prunera in Soller. Outside the walls of Toledo. 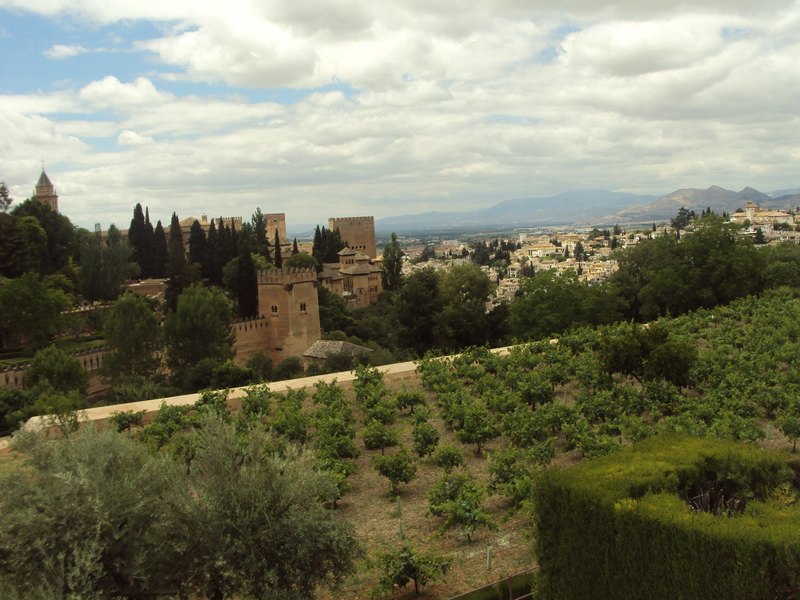 At the start of the Civil War in 1936, a Nationalist garrison of 2000 in the fort of the Alcazar was besieged by a larger Republican army for two months, but was finally relieved. The successful resistance proved a significant morale-booster for the Nationalists. Although it was undoubtedly a brutal and angry conflict, I have always felt able to see the Spanish Civil War, because of the many memorable artistic responses to it, as a fascinating and heroic historical event. Chicken Soup with Barley by Arnold Wesker, the poetry of W.H. Auden, Homage to Catalonia by George Orwell, Pablo Picasso’s Guernica, Robert Motherwell’s Elegies to the Spanish Republic, Republican songs like “Bandiera Rossa”. As Eric Hobsbawn said, the Spanish Civil War is one of the few occasions when history has not been written by the victors. I can’t recall exactly why it was such a topic of such attention in the early 1980s. Possibly because of the fierce arguments and tensions within left-wing politics at that time, possibly because of the imminent arrival of that politically and culturally iconic year 1984. I especially remember a brilliant Edinburgh Fringe show in 1982 by Cambridge REDS called And I Remember Spain, a dramatised compilation of various writings and music from the Civil War. I long ago discarded any programme and the internet frustratingly yields no information, but the text may have been based on a 1974 anthology of the same title by one Murray Sperber. In 1984 itself, I saw some of a Channel 4 documentary series called The Spanish Civil War. The sort of serious programme which we took for granted in the early days of Channel 4, when the channel had the benefit of the regional ITV companies as well as the new independent producers. Rediscovering it on You Tube, I saw for the first time that the script had been written by the great Scottish journalist Neal Ascherson, of whose Observer writings, especially on Eastern Europe, I was an avid reader at that time. 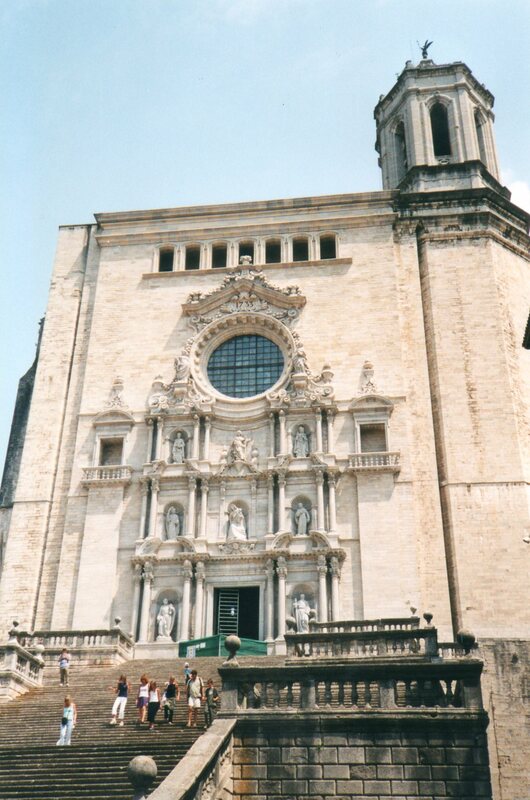 Girona Cathedral. Girona was in Republican-held territory during the Civil War until the Nationalists took it in February 1939. Its fall signalled the beginning of the end of the Civil War. Directed by David Hart for Granada TV, it has a visual style which harks back to earlier famous series like The Great War and the The World at War. A dense text full of detailed references to the revolution, to the various disparate factions within the two forces and to their forgotten leaders. A grave disembodied commentary voice – in this case belonging to Frank Finlay. Evocative film footage, movie as well as still. And, especially, eye-witness accounts which really do come from a totally different time and place, spoken by people who look far younger than the 70 or 80 years old that in most cases they must have been. Ronda. A massacre of Nationalist supporters took place here at the start of the Civil War. 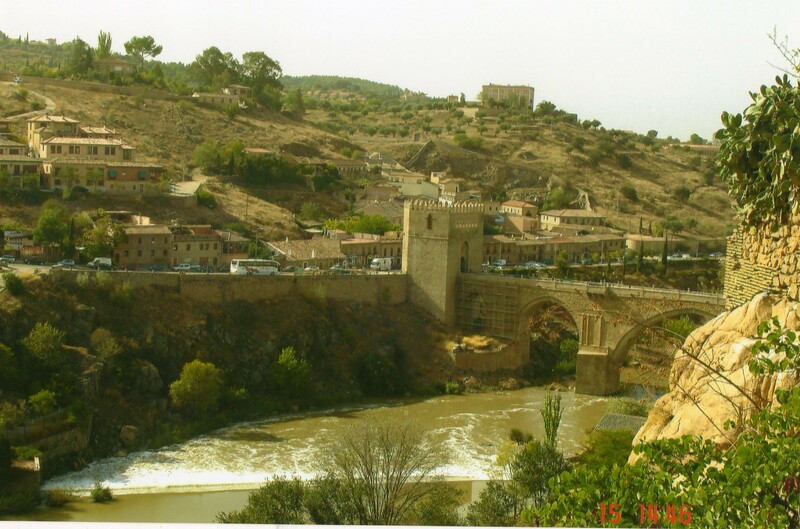 They were forced to run the gauntlet from the former town hall (the large building in the centre) and were thrown over the bridge to their deaths. Ernest Hemingway used the incident in “For Whom the Bell Tolls”. In documentaries now we seem so dependent on a template of camera close-ups, intrusive music, pregnant pauses and tearful testimony. Here, in contrast, male and female witnesses are permitted to speak in a dispassionate straightforward way about the violence, treachery, suffering and sacrifice, giving an honest record of memories and feelings, either not receiving or ignoring any prompts from the unseen interviewer. Editing and music is applied in a restrained fashion. Only one (male) witness is seen in tears, and the commentary draws attention to this as unusual and unavoidable: a man who remembers his socialist father killed after the Civil War by local Nationalists and how he had to continue living normally near the people whom he knew were responsible. A few contributors are English-speaking, notably the Scots journalist Willie Forrest. His obituary here adds further information about what an amazing person he must have been. 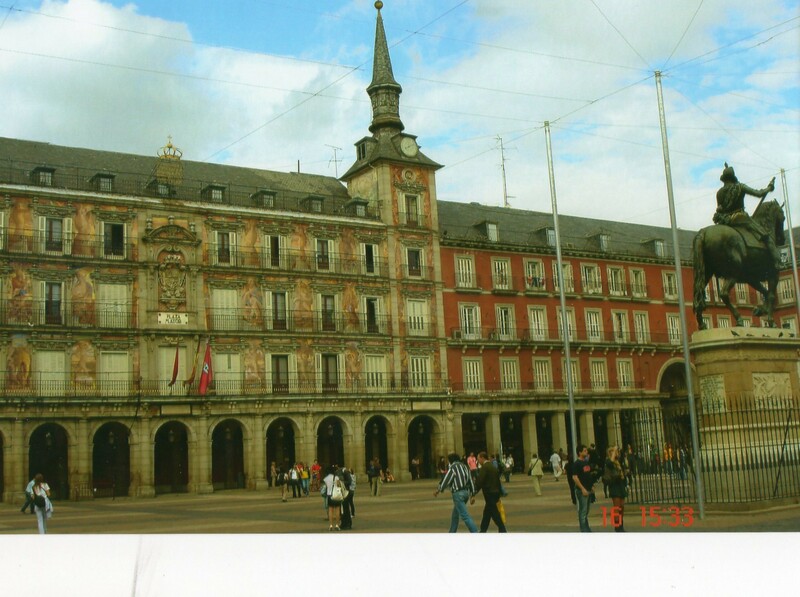 Plaza Major in Madrid. The capital, held by the Republican government, was under constant attack by the Nationalists throughout the Civil War. 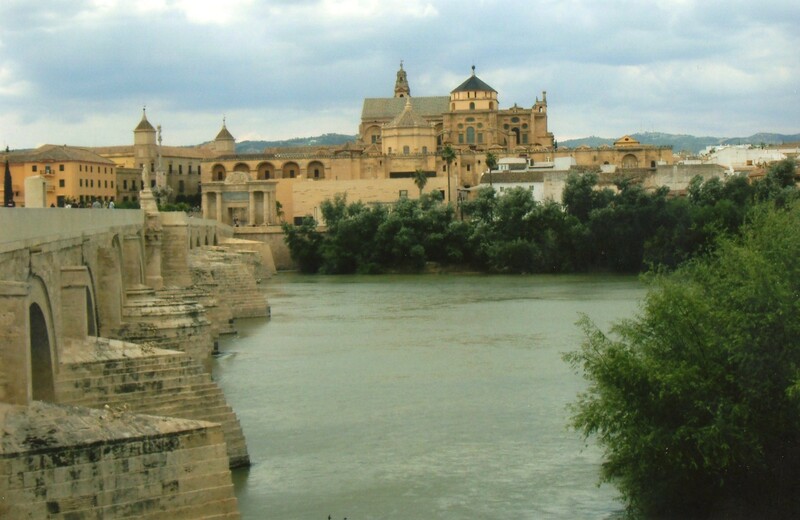 Cordoba, which was occupied by Nationalist forces during the Civil War. 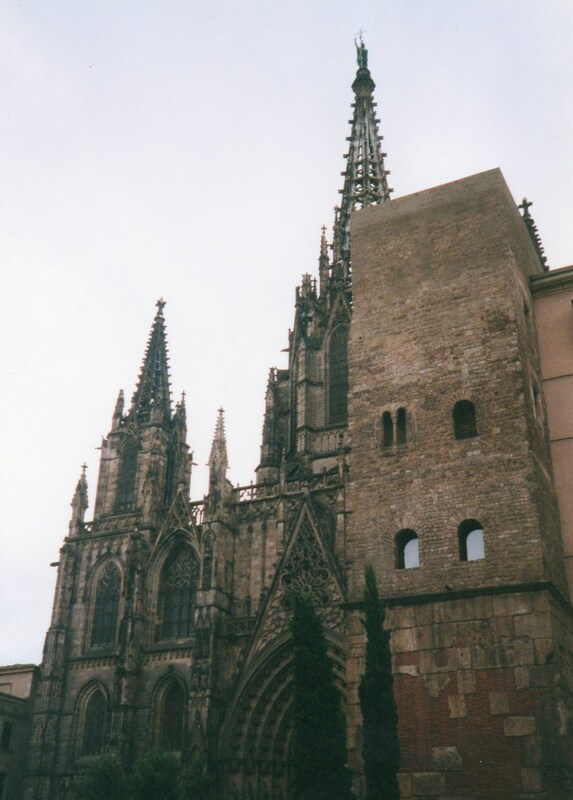 Barcelona Cathedral. Barcelona was the Republican government capital from 1937 but fell to the Nationalists in January 1939. 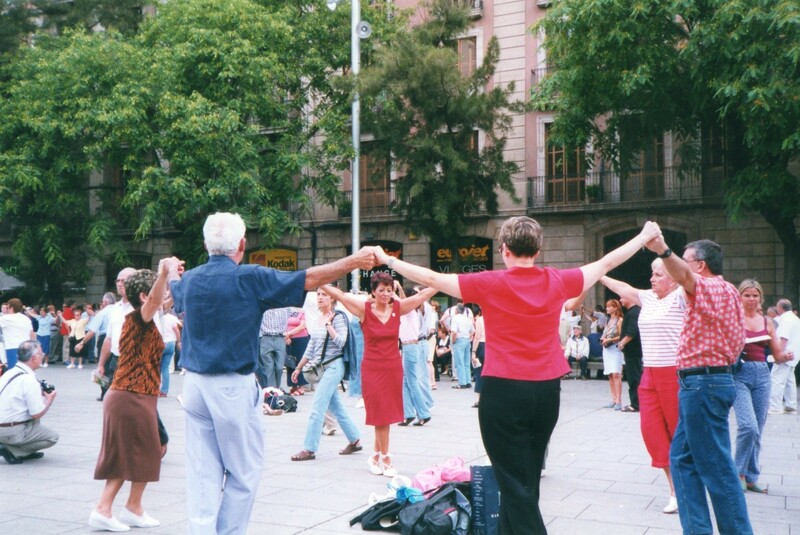 Dancing the Sardana outside Barcelona Cathedral. This traditional Catalan dance was banned by General Franco after the Spanish Civil War. The Spanish Civil War still retains a grip on the popular imagination, despite its political complexities, because of the artists associated with it. Orwell, Hemingway, Auden, Picasso and, a rather different figure, Lorca. Federico Garcia Lorca’s plays are romantic and sensual, with female characters who are attempting to break out from restrictions imposed by family and tradition. Yerma yearns for a child and kills the husband who refuses to co-operate with her desire. In The House of Bernarda Alba the youngest daughter Adela seeks her own destiny rather than that imposed by parental instruction and social custom. In Blood Wedding the Bride is drawn to her previous lover Leonardo, whose family has caused violence in the community before. 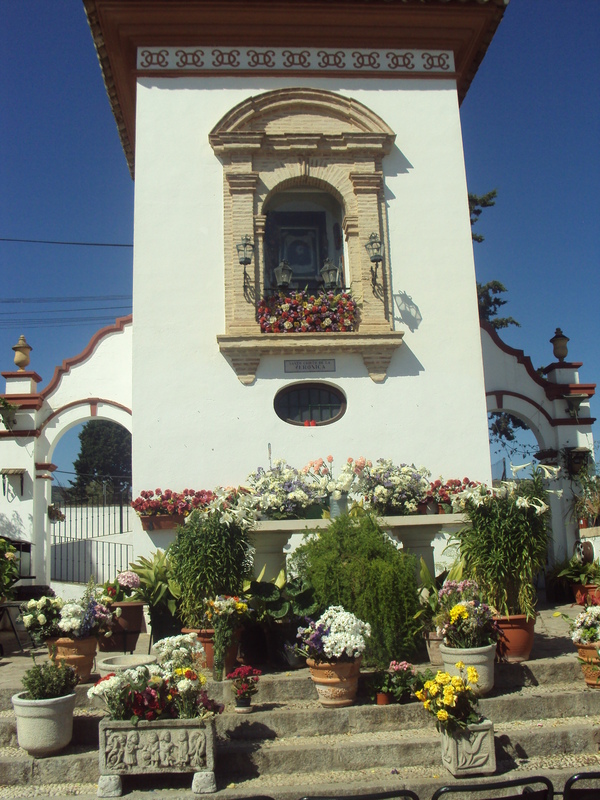 In Lorca’s plays the Catholic Church and the Spanish countryside are often equally powerful forces. At first glance, the work of contemporary Spanish film-maker Pedro Almodóvar seems dissimilar : much gaudier and broader. But I feel his Volver is reminiscent of Lorca : the women tending the cemeteries in the wind-swept village is a little like the scene in Yerma where Dolores and Yerma are praying in a cemetery to speed the latter’s pregnancy. It is often said that homosexual male artists show a particular sensitivity in observing and analysing the female experience : perhaps this holds true with Lorca and Almodovar. For full effect, productions of Lorca probably need to be kept in their historical and geographical contexts, and with a certain sense of religious ritual, such as the several Spanish productions on You Tube of The House of Bernarda Alba. 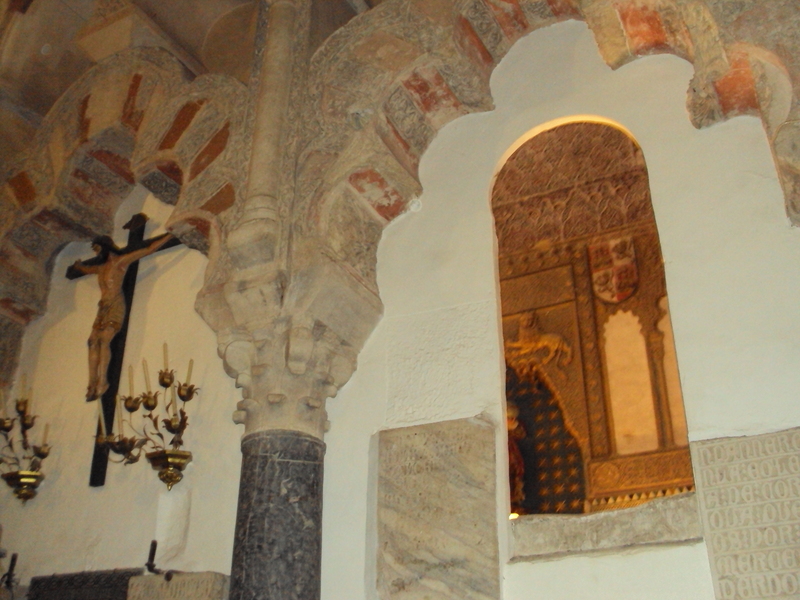 Juxtaposed Christian and Moslem features are typical of Cordoba’s Mezquita : the building which began as a mosque and has since lived an 800 year life as a Catholic cathedral with scarcely any change in its physical appearance. 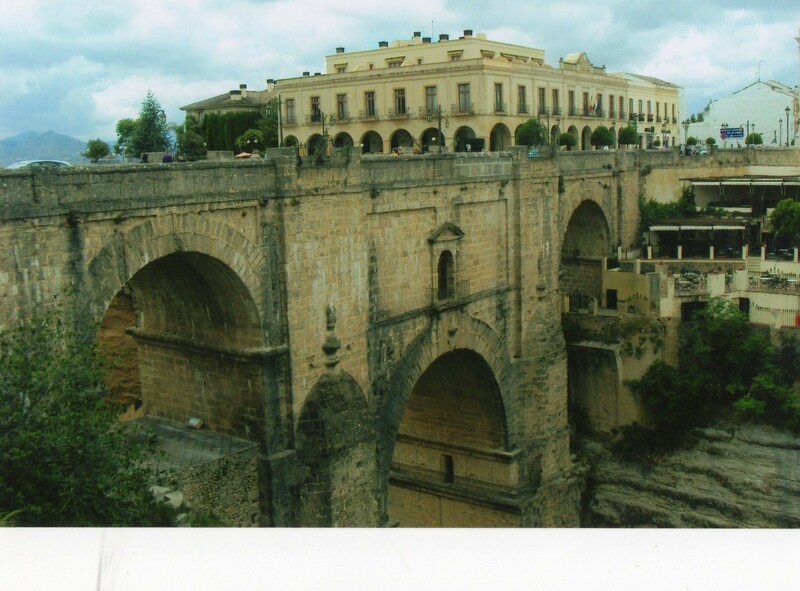 In Ronda, an 18th century bridge, the Puente Nuevo, joins the two halves of the town across a deep gorge. 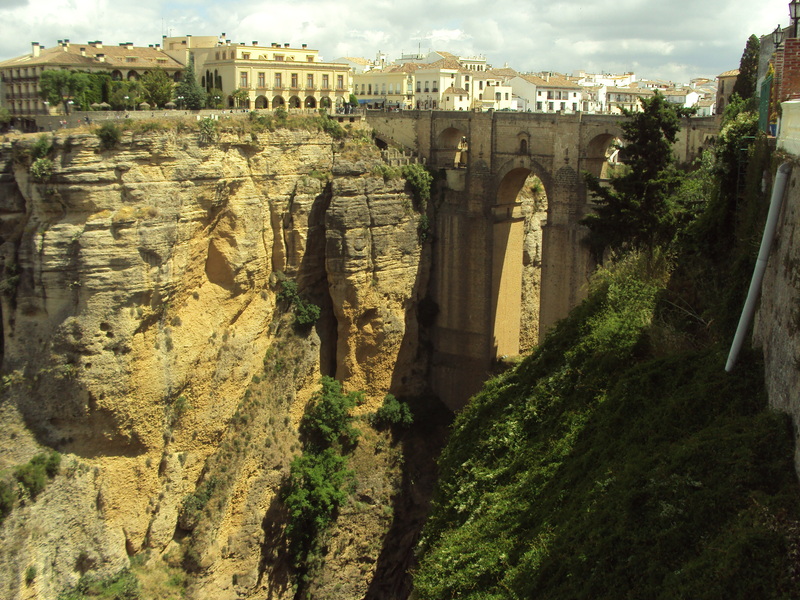 Some of the landscape viewed from Ronda’s Puente Nuevo. 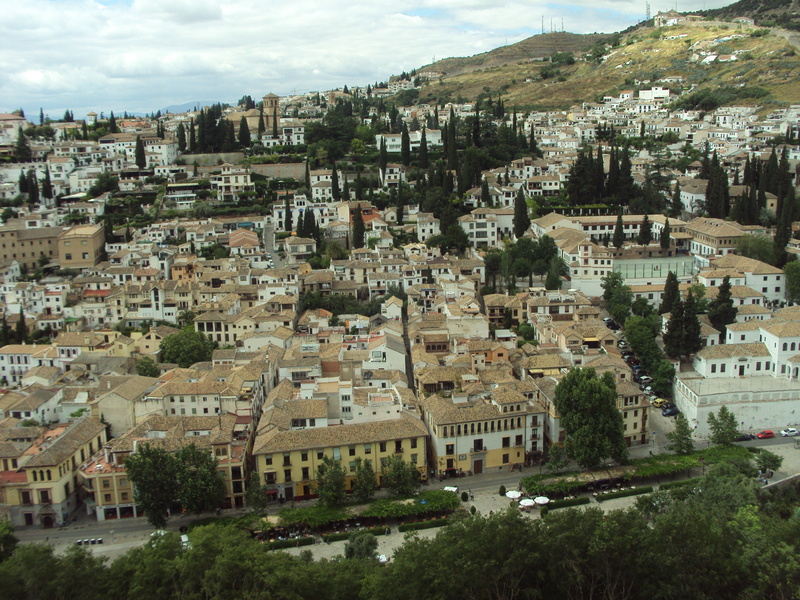 Part of the Alhambra complex in Granada, with the Moslem district of Albaicin in the background. 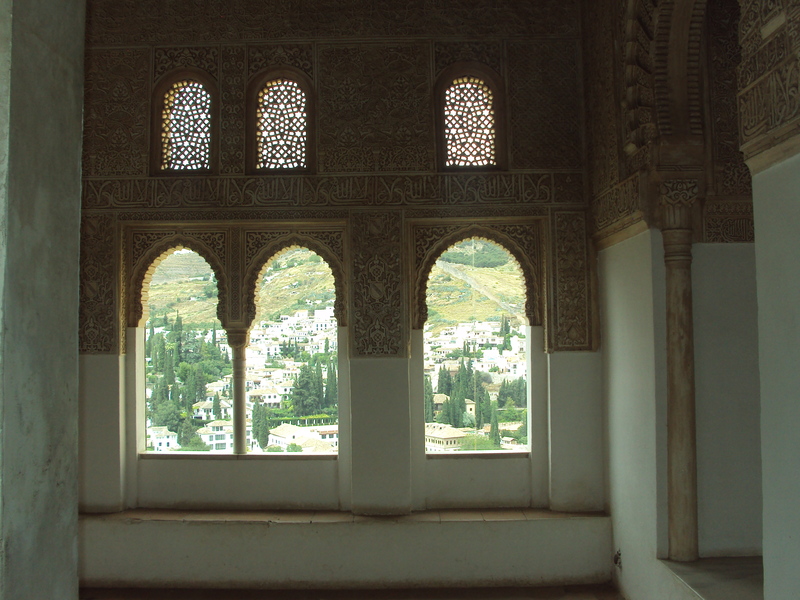 An example of Moorish design inside the Alhambra. “(The Albaicin)… displays an infinite external harmony. Sweet is the dance of the houses round the mount,” wrote Lorca. 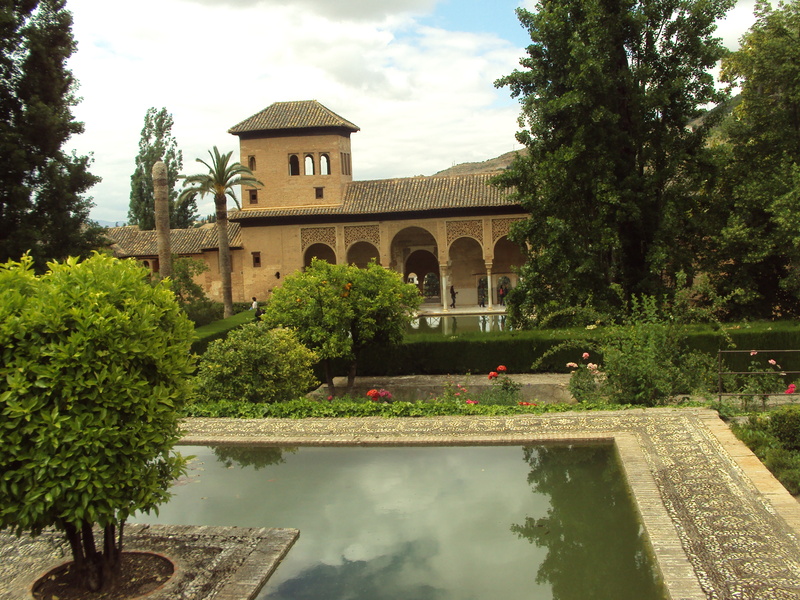 A Moorish exterior in the Alhambra. 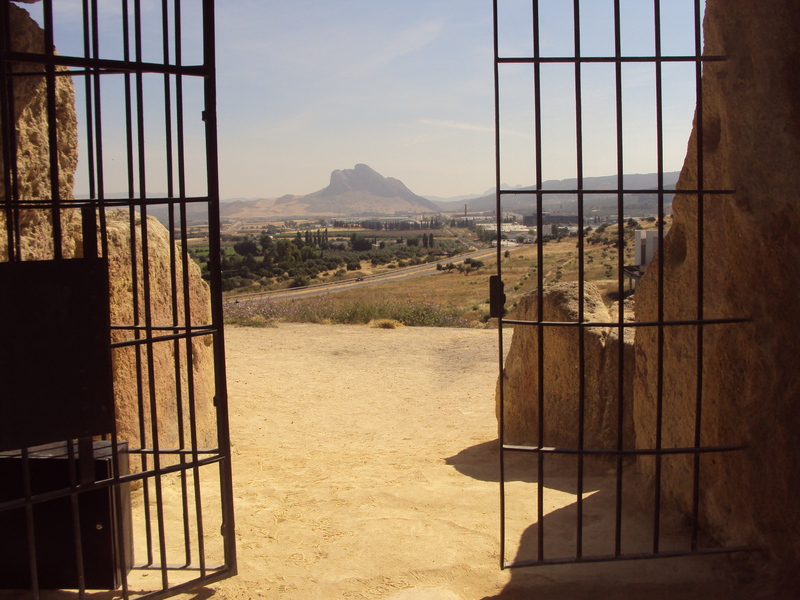 In the distance, the head-like shape of the rock of La Peña de los Enamorados, as seen from the entrance to the Menga dolmen (a prehistoric burial chamber) in Antequera. An ambiguous female figure perhaps appropriate for Lorca’s home region. 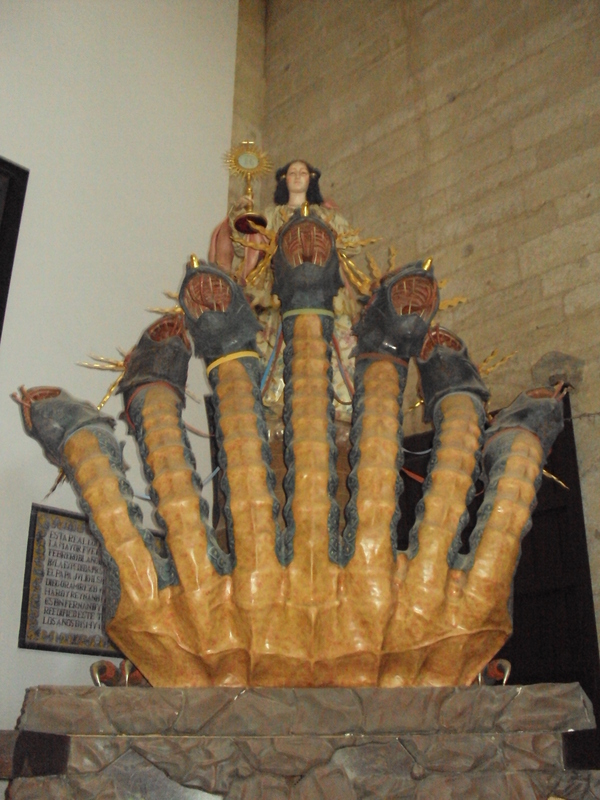 La Tarasca – part woman, part dragon – is a traditional feature of the Corpus Christi procession. 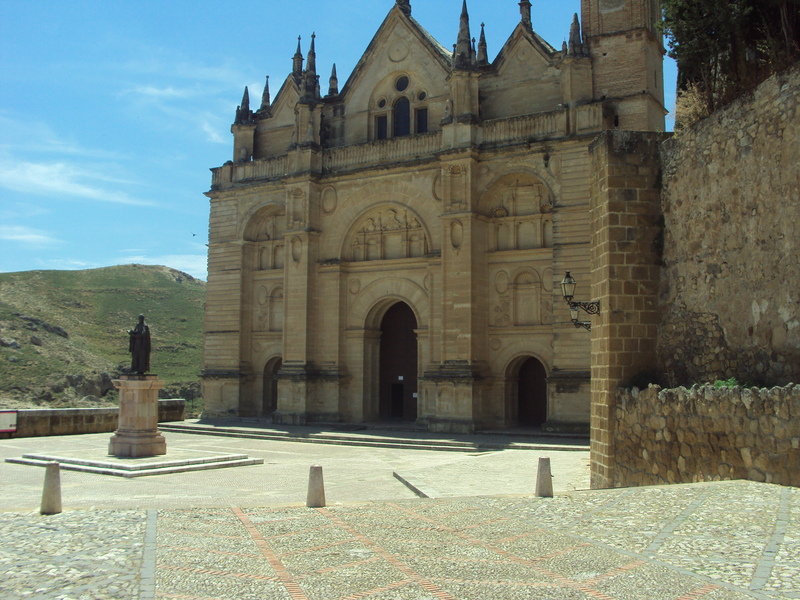 The 16th century Royal Collegiate Church of Santa Maria la Major in Antequera, with the statue of the writer Pedro de Espinosa. Outside Antequera, a shrine to St Veronica, who, according to Christian tradition, wiped the face of Jesus as he carried the cross to his crucifixion.